Buddy Collette’s talent on tenor saxophone, flute, and clarinet is as close to unmatched as it gets. A gifted composer of classical music in addition to his jazz pedigree, Collette continues to fly almost defiantly under the radar of greater renown. Buddy overcame tough racial barriers in the industry by becoming the first African American to perform in a television studio band, appearing on Groucho Marx’s television show, You Bet Your Life. Collette’s artistic and social activism continued when he led a grassroots campaign to desegregate the Los Angeles musician’s union. Today, Buddy is receiving more recognition than ever. Although he no longer performs due to a stroke in 1998, his gleaming beauty, immense talent, and gentle spirit remain intact and highly influential. Collette is a member of the California Jazz Foundation's advisory board. Buddy Collette has passed away, but we remember his charity work. Google trends for "Buddy Collette"
We don't have any news stories about Buddy Collette. 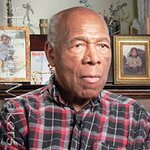 We don't have any videos related to Buddy Collette.